The blue chair was found in a dumpster in our alley. The red chair came from a garage sale for $1. I originally planned to sand it down and repaint it, but as the years have gone on, I have grown to very much love the red. This little chair is my my absolute favourite. It has really pretty carvings on the back rest and is perfectly creaky and wobbly like only a 50 year old chair can be. 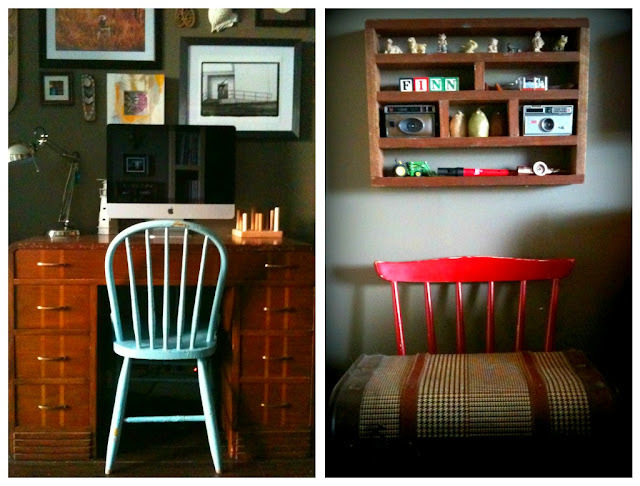 The chair on the left was found at a vintage shop in Bragg Creek during my girlfriend Ami's pre-wedding weekend getaway. It was a bit of an ordeal to get it home (i actually bought two chairs on that trip and had to fit both of them plus three girlfriends and all of our stuff in the trunk), but I love the interesting details on the back and the rounded seat. The little orange chair came from my favourite junk shop here in town - I credit this chair with starting my collection (addiction? ).